This will mean you get the book when it is available at the end of September. This video is a short film I wrote for director Rick James back in 2006. Rick has gone on to work on films such as Hostel part 2 and Wanted and I have gone on to start my own horror comic. It seems that those who love horror are nothing short of ambition, even if their taste in films are sometimes questioned. The film was made almost two years today and I thought I would post it here as a marker of just how much you can accomplish in two years. For those who are interested: it was shot over a period of two sixteen hour days in Scotland for the price of a big mac. We used corn syrup mixed with red food colouring for the blood. I’m busy preparing the cover for issue two at the moment and looking for inspiration and found this. Pitch black driving-in-the-darkness-with-the-headlights-off humour, a semi-clad heroine and a hijacked Coca-Cola spokesman. 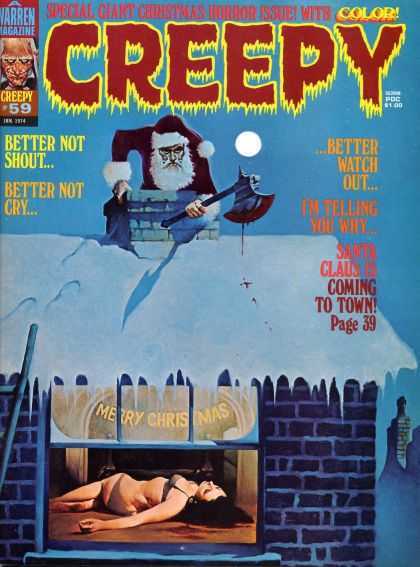 Creepy had an epic run from the mid sixties right through to the eighties. With covers like this, it’s easy to see why. This is why Gil Kane was brilliant. Check the canted angle: the tight space puts the reader in the car with the passengers and we feel their reactions. The hands of the werewolf are approaching – what will happen next? Kane cleverly uses the mirror to reveal the face of the werewolf. Plus, there is the added danger of the oncoming traffic.